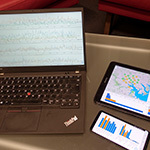 Vistribute enables the automatic distribution of visualizations across different devices by incorporating the properties and relationships of visualization views and connected devices. (iii) a web-based implementation instantiating these heuristics to automatically generate a distribution as well as providing interaction mechanisms for user-defined adaptations. 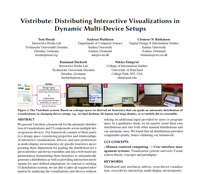 May 07 (Tue), 14:00, Session Displays, Devices, and Interaction for Visualization, first talk. An online demo will be available soon, too. We have also published a blog post about Vistribute on Medium. Erscheint in Proceedings of the ACM Conference on Human Factors in Computing Systems.CHI '19, Glasgow, Scotland, UK.ACM,2019.10.1145/3290605.3300846Links: Video Preview, Github.